Marchant, J.N. * & Broom, D.M. (2001) Factores que afectan el cambio de postura en cerdas gestantes en estabulacion libre o confinadas. Anaporc, 208: 90-110. Marchant-Forde, J.N. *, Lay Jr., D.C.*, Richert, B.T., Schinckel, A.P. and Pajor, E.A. (2003) The effects of Ractopamine on behavior and physiology of finishing pigs. Journal of Animal Science, 81: 416-422. Marchant-Forde, J.N. * and Marchant-Forde, R.M. * (2005) Methods to reduce aggression at mixing in swine. Invited review – Pig News & Information, 26: 63N-73N. Ritter, M.J.*, Ellis, M.*, Berry, N.L., Curtis, S.E., Anil, L., Benjamin, M., Butler, D., Dewey, C., Driessen, B., DuBois, P., Hill, J., Marchant-Forde, J.N., Matzat, P., McGlone, J.J., Mormede, P., Moyer, T., Pfalzgraf, K., Salak-Johnson, J., Sterle, J., Stull, C., Whiting, T., Wolter, B., Niekamp, S.R. * and Johnson, A.K. * (2009) Transport losses in market weight pigs: I. A review of definitions, incidence and economic impact. Professional Animal Scientist, 25: 404-414. Marchant-Forde, J.N. * (2015) The science of animal behavior and welfare: challenges, opportunities and global perspective. Frontiers in Veterinary Science. 2:16-21. doi:10.3389/fvets.2015.00016. Marchant-Forde, J.N. – Ed. (2009) The Welfare of Pigs. Springer Science + Business Media B.V., Dordrecht, The Netherlands. 330pp. Mills, D.S., Marchant-Forde, J.N., McGreevy, P., Morton, D.B., Nicol, C.J., Phillips, C.J.C., Sandøe, P. and Swaisgood, R. – Eds. (2010) The Encyclopedia of Applied Animal Behaviour and Welfare. CAB International, Abingdon, United Kingdom. 685pp. Pajor, E.A. and Marchant-Forde, J.N. (2011) Proceedings of the 45th Congress of the International Society for Applied Ethology. Wageningen Academic Publishers, Wageningen, The Netherlands. 166pp. Marchant-Forde, J.N. – Ed. (2014) 豬的福利 (The Welfare of Pigs - Translated from English Language Edition), China Agriculture Press, Beijing, China. 354pp. Marchant-Forde, J.N. * (2009) Introduction to the Welfare of Pigs. In: Marchant-Forde, J.N. (Editor) The Welfare of Pigs. Springer Science + Business Media B.V., Dordrecht, The Netherlands. pp1-12. Lay, D.C.* and Marchant-Forde, J.N. * (2009) Future perspectives on pig welfare. In: Marchant-Forde, J.N. (Editor) The Welfare of Pigs. Springer Science + Business Media B.V., Dordrecht, The Netherlands. pp331-342. Marchant-Forde, J.N. * (2010) Agonistic Behavior. In: Mills, D.S., Marchant-Forde, J.N., McGreevy, P.D., Morton, D.B., Nicol, C.J., Phillips, C.J.C., Sandøe, P. and Swaisgood, R. (Eds) The Encyclopedia of Applied Animal Behaviour and Welfare. CAB International, Abingdon, United Kingdom. pp10-11. Marchant-Forde, J.N. * (2010) Bar-biting. In: Mills, D.S., Marchant-Forde, J.N., McGreevy, P.D., Morton, D.B., Nicol, C.J., Phillips, C.J.C., Sandøe, P. and Swaisgood, R. (Eds) The Encyclopedia of Applied Animal Behaviour and Welfare. CAB International, Abingdon, United Kingdom. p48. Marchant-Forde, J.N. * (2010) Belly-nosing. In: Mills, D.S., Marchant-Forde, J.N., McGreevy, P.D., Morton, D.B., Nicol, C.J., Phillips, C.J.C., Sandøe, P. and Swaisgood, R. (Eds) The Encyclopedia of Applied Animal Behaviour and Welfare. CAB International, Abingdon, United Kingdom. pp55-56. Marchant-Forde, J.N. * (2010) Dynorphin. In: Mills, D.S., Marchant-Forde, J.N., McGreevy, P.D., Morton, D.B., Nicol, C.J., Phillips, C.J.C., Sandøe, P. and Swaisgood, R. (Eds) The Encyclopedia of Applied Animal Behaviour and Welfare. CAB International, Abingdon, United Kingdom. pp193-194. Marchant-Forde, J.N. * (2010) Endocrinology. In: Mills, D.S., Marchant-Forde, J.N., McGreevy, P.D., Morton, D.B., Nicol, C.J., Phillips, C.J.C., Sandøe, P. and Swaisgood, R. (Eds) The Encyclopedia of Applied Animal Behaviour and Welfare. CAB International, Abingdon, United Kingdom. p219. Marchant-Forde, J.N. * (2010) Engram. In: Mills, D.S., Marchant-Forde, J.N., McGreevy, P.D., Morton, D.B., Nicol, C.J., Phillips, C.J.C., Sandøe, P. and Swaisgood, R. (Eds) The Encyclopedia of Applied Animal Behaviour and Welfare. CAB International, Abingdon, United Kingdom. p220. Marchant-Forde, J.N. * (2010) Epidemiology. In: Mills, D.S., Marchant-Forde, J.N., McGreevy, P.D., Morton, D.B., Nicol, C.J., Phillips, C.J.C., Sandøe, P. and Swaisgood, R. (Eds) The Encyclopedia of Applied Animal Behaviour and Welfare. CAB International, Abingdon, United Kingdom. p224. Marchant-Forde, J.N. * (2010) Humane Societies. In: Mills, D.S., Marchant-Forde, J.N., McGreevy, P.D., Morton, D.B., Nicol, C.J., Phillips, C.J.C., Sandøe, P. and Swaisgood, R. (Eds) The Encyclopedia of Applied Animal Behaviour and Welfare. CAB International, Abingdon, United Kingdom. p329. Marchant-Forde, J.N. * (2010) Humane Society of the United States. In: Mills, D.S., Marchant-Forde, J.N., McGreevy, P.D., Morton, D.B., Nicol, C.J., Phillips, C.J.C., Sandøe, P. and Swaisgood, R. (Eds) The Encyclopedia of Applied Animal Behaviour and Welfare. CAB International, Abingdon, United Kingdom. p329. Marchant-Forde, J.N. * (2010) International Society for Applied Ethology. In: Mills, D.S., Marchant-Forde, J.N., McGreevy, P.D., Morton, D.B., Nicol, C.J., Phillips, C.J.C., Sandøe, P. and Swaisgood, R. (Eds) The Encyclopedia of Applied Animal Behaviour and Welfare. CAB International, Abingdon, United Kingdom. p360. Marchant-Forde, J.N. * (2010) Libido. In: Mills, D.S., Marchant-Forde, J.N., McGreevy, P.D., Morton, D.B., Nicol, C.J., Phillips, C.J.C., Sandøe, P. and Swaisgood, R. (Eds) The Encyclopedia of Applied Animal Behaviour and Welfare. CAB International, Abingdon, United Kingdom. pp385-386. Marchant-Forde, J.N. * (2010) Novelty. In: Mills, D.S., Marchant-Forde, J.N., McGreevy, P.D., Morton, D.B., Nicol, C.J., Phillips, C.J.C., Sandøe, P. and Swaisgood, R. (Eds) The Encyclopedia of Applied Animal Behaviour and Welfare. CAB International, Abingdon, United Kingdom. pp434-435. Marchant-Forde, J.N. * (2010) Pig. In: Mills, D.S., Marchant-Forde, J.N., McGreevy, P.D., Morton, D.B., Nicol, C.J., Phillips, C.J.C., Sandøe, P. and Swaisgood, R. (Eds) The Encyclopedia of Applied Animal Behaviour and Welfare. CAB International, Abingdon, United Kingdom. pp473-476. Marchant-Forde, J.N. * (2010) Posture. In: Mills, D.S., Marchant-Forde, J.N., McGreevy, P.D., Morton, D.B., Nicol, C.J., Phillips, C.J.C., Sandøe, P. and Swaisgood, R. (Eds) The Encyclopedia of Applied Animal Behaviour and Welfare. CAB International, Abingdon, United Kingdom. pp481-483. Marchant-Forde, J.N. * (2010) Proceptivity. In: Mills, D.S., Marchant-Forde, J.N., McGreevy, P.D., Morton, D.B., Nicol, C.J., Phillips, C.J.C., Sandøe, P. and Swaisgood, R. (Eds) The Encyclopedia of Applied Animal Behaviour and Welfare. CAB International, Abingdon, United Kingdom. p488. Marchant-Forde, J.N. * (2010) Seasonality. In: Mills, D.S., Marchant-Forde, J.N., McGreevy, P.D., Morton, D.B., Nicol, C.J., Phillips, C.J.C., Sandøe, P. and Swaisgood, R. (Eds) The Encyclopedia of Applied Animal Behaviour and Welfare. CAB International, Abingdon, United Kingdom. p536. Marchant-Forde, J.N. * (2010) Stone-chewing. In: Mills, D.S. et al. (Eds) The Encyclopedia of Applied Animal Behaviour and Welfare. CAB International, Abingdon, United Kingdom. pp581-582. Marchant-Forde, J.N. * (2010) Testosterone. In: Mills, D.S., Marchant-Forde, J.N., McGreevy, P.D., Morton, D.B., Nicol, C.J., Phillips, C.J.C., Sandøe, P. and Swaisgood, R. (Eds) The Encyclopedia of Applied Animal Behaviour and Welfare. CAB International, Abingdon, United Kingdom. pp598-599. Marchant-Forde, J.N. * (2010) Tooth. In: Mills, D.S., Marchant-Forde, J.N., McGreevy, P.D., Morton, D.B., Nicol, C.J., Phillips, C.J.C., Sandøe, P. and Swaisgood, R. (Eds) The Encyclopedia of Applied Animal Behaviour and Welfare. CAB International, Abingdon, United Kingdom. pp610-611. Marchant-Forde, J.N. * (2010) Ultrasound. In: Mills, D.S., Marchant-Forde, J.N., McGreevy, P.D., Morton, D.B., Nicol, C.J., Phillips, C.J.C., Sandøe, P. and Swaisgood, R. (Eds) The Encyclopedia of Applied Animal Behaviour and Welfare. CAB International, Abingdon, United Kingdom. pp621-623. Marchant-Forde, J.N. * (2010) Urine. In: Mills, D.S., Marchant-Forde, J.N., McGreevy, P.D., Morton, D.B., Nicol, C.J., Phillips, C.J.C., Sandøe, P. and Swaisgood, R. (Eds) The Encyclopedia of Applied Animal Behaviour and Welfare. CAB International, Abingdon, United Kingdom. pp625-626. Marchant-Forde, J.N. * (2010) Weaner. In: Mills, D.S., Marchant-Forde, J.N., McGreevy, P.D., Morton, D.B., Nicol, C.J., Phillips, C.J.C., Sandøe, P. and Swaisgood, R. (Eds) The Encyclopedia of Applied Animal Behaviour and Welfare. CAB International, Abingdon, United Kingdom. pp635-637. Marchant-Forde, J.N. * (2010) Weight Gain. In: Mills, D.S., Marchant-Forde, J.N., McGreevy, P.D., Morton, D.B., Nicol, C.J., Phillips, C.J.C., Sandøe, P. and Swaisgood, R. (Eds) The Encyclopedia of Applied Animal Behaviour and Welfare. CAB International, Abingdon, United Kingdom. pp641-642. Rodenburg T.B. and Marchant-Forde, J.N. (2016) Weight Gain. In: Brown, J. and Seddon, Y. (Eds) Animals and Us: 50 years of the ISAE. Wageningen Academic Publishers, Wageningen, The Netherlands. In Preparation. Marchant, J.N. * and Broom, D.M. (1993) The effects of dry sow housing conditions on responses to farrowing. Animal Production, 56: 475-476. Marchant, J.N. * and Rudd, A.R. (1993) Differences in heart rate response at feeding between stall-housed and group-housed sows. Animal Production, 56: 423. Marchant, J.N. * and Broom, D.M. (1993) The effects of sow housing on responses to farrowing conditions. Applied Animal Behaviour Science, 38: 81-82. Marchant, J.N. * and Broom, D.M. (1993) The effects of dry sow housing conditions on lying behaviour of sows. In. Proceedings of the International Congress on Applied Ethology, (eds. M. Nichelmann, H.K. Wierenga & S. Braun), pp455-458. KTBL, Darmstadt, Germany. Marchant, J.N. *, Broom, D.M. and Rudd, A.R. (1994) Heart rate responses of group-housed sows to agonistic social interactions. In. Proceedings of the 28th International Congress of the International Society for Applied Ethology, (Eds. M.H. Giersing, C.C. Krohn, H.B. Simonsen, K. Vestergaard and L.L. Jeppesen), p31, National Institute of Animal Science, Denmark. Marchant, J.N. * and Broom, D.M. (1994) The effects of dry sows housing conditions on heart rate responses to feeding and suckling in farrowing crates. In. Proceedings of the 28th International Congress of the International Society for Applied Ethology, (Eds. M.H. Giersing, C.C. Krohn, H.B. Simonsen, K. Vestergaard and L.L. Jeppesen), p40, National Institute of Animal Science, Denmark. Broom, D.M. *, Mendl, M.T. and Marchant, J.N. (1994) Lifetime studies of dry sow welfare in three housing conditions. Proceedings of the 45th Annual Meeting of EAAP, 333. Marchant, J.N. * and Broom, D.M. (1994) The effects of dry sow housing conditions on bone strength and muscle conformation. Animal Production, 58: 437-438. Marchant, J.N. * and Broom, D.M. (1994) Lying behaviour of dry sows in relation to housing conditions. Animal Production, 58: 474. Marchant, J.N. * and Broom, D.M. (1994) Dry sow housing-induced anatomical differences and the effects on lying behaviour. Animal Production, 58: 474. Marchant, J.N. * and Broom, D.M. (1994) Effects of housing system on movement and leg strength in sows. Applied Animal Behaviour Science, 41: 275-276. Marchant, J.N. * and Broom, D.M. (1994) The relationships between sow size and piglet mortality due to crushing in confined and open farrowing systems. Proceedings of the 45th Annual Meeting of EAAP, 338. Broom, D.M. *, Mendl, M.T. and Marchant, J.N. (1995) The welfare of sows kept in one of three housing conditions throughout lifetime. Applied Animal Behaviour Science, 44: 258-259. Kennedy, M.J.*, Marchant, J.N. * and Broom, D.M. (1995) A behavioural and physiological study of the responses of inexperienced gilts to electric fences. In. Proceedings of the 29th International Congress of the International Society for Applied Ethology, (Eds. S.M. Rutter, J. Rushen, H.D. Randle, J. Eddison), pp31-32, UFAW, Potter’s Bar, London. Kennedy, M.J.*, Marchant, J.N. * and Broom, D.M. (1995) The behavioural and heart rate responses of inexperienced gilts to electric fencing. In. Book of Abstracts for 46th Annual Meeting of EAAP, (ed. J.A.M. van Arendonk), p305, Wageningen Pers, Wageningen, The Netherlands. Marchant, J.N. *, Broom, D.M., Rudd, A.R. and Mendl, M.T. * (1995) Agonistic social interactions and heart rate responses of group-housed sows. Animal Science, 60: 565. Marchant, J.N. * and Broom, D.M. (1995) Basal heart rate of group-housed sows in relation to stage of gestation. In. Proceedings of the 29th International Congress of the International Society for Applied Ethology, (Eds. S.M. Rutter, J. Rushen, H.D. Randle, J. Eddison), pp77-78, UFAW, Potter’s Bar, London. Marchant, J.N. *, Broom, D.M., and Rudd, A.R. (1995) Heart rate responses of group-housed sows to agonistic social interactions. Applied Animal Behaviour Science, 44: 269. Marchant, J.N. *, Broom, D.M. and Corning, S. (1996) The effects of sow maternal behaviour on piglet mortality in an open farrowing system. Animal Science, 62: 675. Marchant, J.N. *, Corning, S. and Broom, D.M. (1996) The effects of production parameters on piglet mortality in an open farrowing system. Animal Science, 62: 675-676. Marchant, J.N. *, Broom, D.M. and Corning, S. (1996) The influence of sow lying behaviour on piglet mortality in an open farrowing system. In. Proceedings of the 30th International Congress of the International Society for Applied Ethology, (Eds. I.J.H. Duncan, T.M. Widowski, & D.B. Haley), p41, Centre for the Study of Animal Welfare, Guelph, Ontario. Marchant, J.N. *, Corning, S. and Broom, D.M. (1997) Factors influencing the risk of piglets being crushed during sow posture-changing in a group farrowing system. Proceedings of the British Society of Animal Science, 1997, p44. Marchant, J.N. *, Burfoot, A., Corning, S. and Broom, D.M. (1997) The ‘Human Approach Test’ – a test of fearfulness or investigatory behaviour? In. Proceedings of the 31st International Congress of the International Society for Applied Ethology, (Eds. P.H. Hemsworth, M. Spinka, & L’. Kostal), p182, Research Institute of Animal Production, Uhrineves, Czech Republic. Marchant, J.N. * and Whittaker, X. * (1997) Vocalisations of the adult domestic pig during a standard human approach test. In. Proceedings of the 31st International Congress of the International Society for Applied Ethology, (Eds. P.H. Hemsworth, M. Spinka, & L’. Kostal), p182, Research Institute of Animal Production, Uhrineves, Czech Republic. Marchant, J.N. * (1998) Stockperson-directed aggression shown by sows in farrowing crates and farrowing pens: relationships with responses to human during gestation and with piglet survival. Proceedings of the British Society of Animal Science, 1998, p113. Marchant, J.N. *, Broom, D.M. and Corning, S. (1998) Behaviour and production of sows in an open pen farrowing system: effects of pen width. Proceedings of the British Society of Animal Science, 1998, p112. Marchant, J.N. * (1998) Sow aggression towards the stockperson: relationships with approach test parameters and piglet survival. In. Proceedings of the 32nd International Congress of the International Society for Applied Ethology, (Eds. I. Veissier & A. Boissy), p109, Institut National de la Recherche Agronomique, France. Forde, R.M. *, Marchant, J.N. * and Spoolder, H.A.M. (1998) The approach test acclimatisation period: how long is long enough for sows? In. Proceedings of the 32nd International Congress of the International Society for Applied Ethology, (Eds. I. Veissier & A. Boissy), p220, Institut National de la Recherche Agronomique, France. Forde, R.M. *, Marchant, J.N. * and Spoolder, H.A.M (1999) Investigation into methodologies of the ‘standard’ human approach test for sows. In. Proceedings of the British Society of Animal Science. P178. Marchant, J.N. *, Forde, R.M. *, Corning, S. and Broom, D.M., (1999) The effects of farrowing system design on gilt behaviour. In. Proceedings of the British Society of Animal Science. P185. Forde, R.M. * and Marchant, J.N. * (1999) Heart Rate Variability: a novel non-invasive means of assessing fear responses in animals? In. Proceedings of the 33rd International Congress of the International Society for Applied Ethology, (Eds. K.Bøe, M. Bakken & B.O. Braastad), p121, Agricultural University of Norway, Ås, Norway. Marchant, J.N. *, Forde, R.M. * and Spoolder, H.A.M. (1999) The effect of test arena location on behaviour and heart rate of sows during a human approach test. In. Proceedings of the 33rd International Congress of the International Society for Applied Ethology, (Eds. K.Bøe, M. Bakken & B.O. Braastad), p166, Agricultural University of Norway, Ås, Norway. Marchant, J.N. *, Forde, R.M. and Weary, D.M. *, (2000) Behavioural and heart rate responses of cows and calves to each other’s vocalisations after early separation. In. Proceedings of the British Society of Animal Science. p30. Marchant, J.N. *, Jensen, K.H. and Forde, R.M. (2000) The effects of straw availability for nest-building on maternal reactivity of crated sows after farrowing. In. Proceedings of the British Society of Animal Science. p31. Malkin, S.J. *, Marchant, J.N., and Day, J.E.L. (2000) The effects of offering different degrees of social contact in indoor farrowing systems on the welfare of piglets post-weaning. In. Proceedings of the British Society of Animal Science. p133. Forde, R.M. *, Marchant, J.N. * and Weary, D.M. (2000) Cardiac and behavioural responses of cows and calves to each other’s vocalisations after early separation. In. Proceedings of the 34th International Congress of the International Society for Applied Ethology (Eds. A. Ramos, L.C. Pinheiro Machado Fo & M.J. Hötzel), pp84-85. Damm, B.I. *, Pedersen, L.J. *, Marchant, J.N. and Jensen, K.H. (2000) The presence of a farrowing nest affects gilt responsiveness to neonatal piglets and interval from birth to first suckle. In. Proceedings of the 34th International Congress of the International Society for Applied Ethology (Eds. A. Ramos, L.C. Pinheiro Machado Fo & M.J. Hötzel), p127. Forde, R.M. * and Marchant, J.N. * (2001) The effects of gestation on behaviour, heart rate and heart rate variability of gilts In. Proceedings of the British Society of Animal Science. p47. Marchant, J.N. *, Broom, D.M. and Corning, S. (2001) The effects of farrowing system design on welfare of sows and piglets of different genotypes. In. Proceedings of the British Society of Animal Science. p175. Ortega, M.*, Horrell, R.I. and Marchant, J.N. (2001) The effect on their behaviour of the age of separation at which dairy calves are separated from their mothers. In. (Eds. J.P. Garner, J.A. Mench & S.P. Heekin) Proceedings of the 35th International Congress of the International Society for Applied Ethology, p200. Marchant, J.N. *, Mills D.S., Schofield E. (2001) Heart rate and behavioural correlates of anxiety assessment in horses In.(Ed. J.E.L. Day) Proceedings of the UK & Eire Regional Meeting for the International Society for Applied Ethology. Forde, R.M. *, Weary, D.M. and Marchant, J.N. (2001) Long-term Psychophysiological Response of Dairy Calves to Hot-Iron dehorning. In.(Ed. J.E.L. Day) Proceedings of the UK & Eire Regional Meeting for the International Society for Applied Ethology. Pedersen, L.J. *, Damm, B.I. *, Marchant-Forde, J.N. and Gilbert, C.L. (2002) Does feed-back from a nest affect prepartum and partum behaviour and periparturient hormones in gilts? In. Proceedings of the Nordic Regional Meeting for the International Society for Applied Ethology. Marchant-Forde, R.M. *, Marchant-Forde, J.N. and Weary, D.M. (2002) Behavioural and cardiovascular responses of dairy calves to hot-iron dehorning. In.(Ed. P.K.Koene) 36th International Congress of the International Society for Applied Ethology. p54. Marchant-Forde, J.N. *, Lay Jr., D.C.*, Pajor, E.A., Richert, B.T., and Schinckel, A.P. (2003) The effects of Ractopamine on behavior and physiology of finishing pigs. In: (Ed: R. Reynnells) The Science and Ethics Behind Animal Well-Being Assessment. Future Trends in Animal Agriculture, USDA/CREES/PAS, Washington DC. pp19-20. Brumm, M.C. *, Richert, B.T., Marchant-Forde, J.N. and Marchant-Forde, R.M. (2004) Out-of-feed events in grow-finish pigs: causes and consequences. Proceedings George A. Young Swine Health and Management Conference, University of Nebraska, Lincoln, pp 6-15. Marchant-Forde, J.N. * and Lay, D.C. (2004) Bridging differences between Europe and the USA: Research. In: (Ed: R. Reynnells) Local and Global Considerations in Animal Agriculture: The Big Picture. Future Trends in Animal Agriculture, USDA/CREES/PAS, Washington DC. pp54-57. Jones, C.*, Pajor, E.A., Donkin, S.S., Marchant-Forde, J.N. and Schutz, M.M. * (2005) Effect of recorded calf vocalizations on milk production with an automatic milking system. Journal of Animal Science, 83 (Suppl 2): 35. Richert, B.T. *, Hinson, R.B., Marchant-Forde, R.M., Lay Jr., D.C., McMunn, K.A. and Marchant-Forde, J.N. * (2005) Effects of albuterol on the growth and carcass characteristics of finishing pigs. Journal of Animal Science, 83 (Suppl 1): 345. Marchant-Forde, J.N. *, McMunn, K.A., Richert, B.T., Lay Jr., D.C. and Marchant-Forde, R.M. 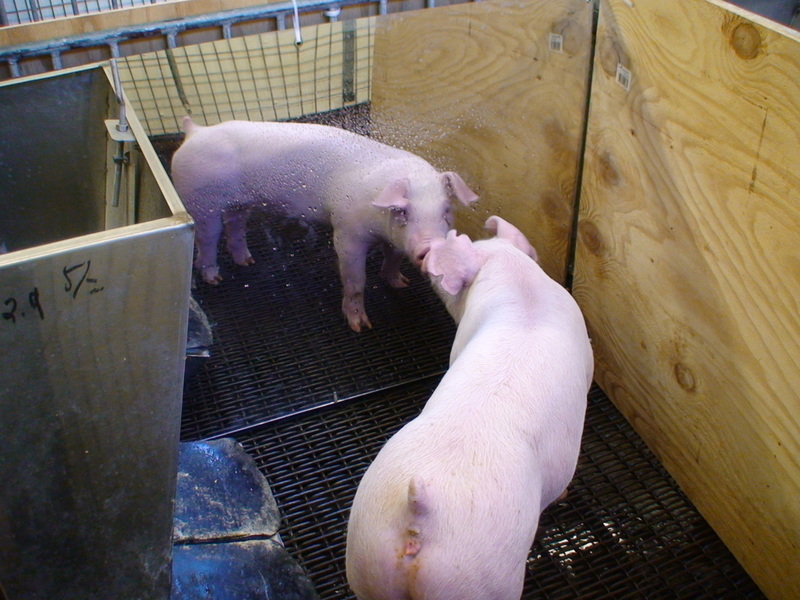 (2005) Effects of albuterol on behavioral and heart rate responses of finishing pigs to handling. Journal of Animal Science, 83 (Suppl 1): 324. Lay Jr., D.C.*, Marchant-Forde, J.N. *, Richert, B.T., Marchant-Forde, R.M. and McMunn, K.A. (2005) Effects of albuterol on the physiology of finishing pigs. Journal of Animal Science, 83 (Suppl 1): 245. Ritter, M.*, Ellis, M.*, Benjamin, M., Berg, E., DuBois, P., Marchant-Forde, J.N., Green, A., Matzat, P., Mormede, P., Moyer, T., Pfalzgraf, K., Siemens, M., Sterle, J., Whiting, T. and Wolter, B. (2005) The fatigued pig syndrome. Journal of Animal Science, 83 (Suppl 1): 258. Marchant-Forde, J.N. *, Lay Jr., D.C., McMunn, K.A., Richert, B.T. and Marchant-Forde, R.M. (2005) Effects of albuterol on behavior and physiology of finishing pigs. In. (Eds. R. Kusunose & S. Sato) 39th International Congress of the International Society for Applied Ethology. P65. Marchant-Forde, J.N. * and Pajor, E.A. (2005) Sow stereotypic behavior in relation to dietary sodium bicarbonate. In. (Eds. R. Kusunose & S. Sato) 39th International Congress of the International Society for Applied Ethology. P134. Williams, J.L. *, Eicher, S.D., Patterson, J.A. and Marchant-Forde, J.N. (2005) Effects of lairage during transport on innate immune function of swine. In: Proceedings of the 86th Annual Meeting of the Conference of Research Workers in Animal Diseases, 2005. St. Louis, MO., p.133, Abst.129. Schenck, E.L.*, McMunn, K.A., Rosenstein, D., Nielsen, B.D., Richert, B.T., Marchant-Forde, J.N., Lay Jr, D.C. (2007) Exercise increases bone density in the joints and limbs of gestating stall-housed gilts. Journal of Animal Science, 85 (Suppl 1): 364. Poletto, R.*, Richert, B.T. and Marchant-Forde, J.N. (2007) Behavioral effects of “step-up” ractopamine feeding program on finishing pigs. In. (Eds. F. Galindo & L. Alvarez) Proceedings of the 41st International Congress of the International Society for Applied Ethology. p90. Schenck, E.L., McMunn, K.A., Nielsen, B.D., Richert, B.T., Marchant-Forde, J.N. and Lay, D.C. (2007) The effects of exercise on production, interbirth intervals, and lying behaviours in gestating stall-housed gilts. In. (Eds. F. Galindo & L. Avarez) Proceedings of the 41st International Congress of the International Society for Applied Ethology. p61. Hampsch, J.M., Peters, S., Mann, D.D. *, Guinn, R., Matthews, D.L., Kissinger, C.B. Marchant-Forde, J.N. and Poletto, R. (2007) Prototype device for computerized blood sampling and data collection in freely moving swine. Journal of the American Association for Laboratory Animal Science, 46: 138-139. Poletto, R.*, Rostagno, M.H. *, Richert, B.T. and Marchant-Forde, J.N. (2007) Effect of ractopamine on Enterobacteriaceae levels in swine. In: Proceedings of the 88th Annual Meeting of the Conference of Research Workers in Animal Diseases, 2007. Chicago, IL. P135. Poletto, R., Rostagno, M.H., Richert, B.T., Marchant-Forde, J.N. (2008) Enterobacteriaceae levels in finishing pigs subjected to a ractopamine feeding program. In: Proceedings of the 20th International Pig Veterinary Society International Congress. Vol 1. P.224. Matthews, D.L. *, Poletto, R.*, Marchant-Forde, J.N., Mann, D.D., Guinn, R., Peters, S., Hampsch, J.M., Zhu, Y. and Kissinger, C.B. (2008) Plasma cortisol and norepinephrine concentrations in pigs: automated sampling of freely moving pigs housed in the PigTurn versus manually sampled and restrained pigs. In. (Eds. L. Boyle, N. O’Connell & A. Hanlon) Proceedings of the 42nd International Congress of the International Society for Applied Ethology. p126. Marchant-Forde, J.N. *, and Marchant-Forde, R.M. (2008) Recent advances in the automatic collection of behavioural and physiological data. In. (Eds. L. Boyle, N. O’Connell & A. Hanlon) Proceedings of the 42nd International Congress of the International Society for Applied Ethology. p5. Poletto, R.*, Cheng, H.W., Meisel, R.L., Richert, B.T. and Marchant-Forde, J.N. (2008) Effects of ractopamine feeding, gender and social rank on aggressiveness and monoamine concentrations in different brain areas of finishing pigs. In. (Eds. L. Boyle, N. O’Connell & A. Hanlon) Proceedings of the 42nd International Congress of the International Society for Applied Ethology. p83. Janczak, A.M.*, Marchant-Forde, R.M., Marchant-Forde, J.N., Hogan, D., Matthews, D.L., Dowell, C., Freeman, L.J. and Lay Jr., D.C. (2008) The value of telemetry for measuring effects of snaring and saline injection on heart rate variability in pigs. In. (Eds. L. Boyle, N. O’Connell & A. Hanlon) Proceedings of the 42nd International Congress of the International Society for Applied Ethology. p194. Lay, Jr, D.C.*, Marchant-Forde, R.M., Janczak, A.M., Marchant-Forde, J.N. and Hogan, D.F. (2009) The use of heart rate variability as a novel method to differentiate between affective states. In: Proceedings of 43rd International Congress of the International Society for Applied Ethology. P120. Rohde-Johnson, C., DeGraw, R.T., Marchant-Forde, J.N., Knipp, G., McCain, R.R. and Matthews, D.L. (2009) ECG and pharmacokinetic assessment in the freely moving pig. In. Proceedings of the Minipig Research Forum 2009. Poletto, R.*, Richert, B.T., Meisel, R.L., Cheng, H.W. and Marchant-Forde, J.N. (2010) Effects of diet on behavioral and neurophysiological indicators of aggression in pigs. Journal of Animal Science, 88 (E.Suppl. 3): 5-6. Poletto, R. Marchant-Forde, R.M., Marchant-Forde J.N., Rault, J.L., Hogan, D.F., and Lay Jr., D.C. (2010) Heart rate variability—A tool to differentiate positive and negative affective states in pigs? Journal of Animal Science, 88 (E.Suppl. 2): 463. Marchant-Forde, J.N. (2010) Social behavior in swine and its impact on welfare. In: S. D’Alliere & R. Friendship (Eds) Proceedings of the 21st International Pig Veterinary Society Congress. IPVS 2010, Vancouver, Canada. P36-39. Rault, J.L., Carter, C.S., Cheng, H.W., Garner, J.P., Marchant-Forde, J.N., Richert, B.T. and Lay Jr. D.C. (2010) Developmental effects of oxytocin in piglets by intranasal or subcutaneous administration. Program # 496.10, 2010 Neuroscience Meeting Planner, San Diego, CA., Society for Neuroscience. Rault, J.L., Carter, C.S., Garner, J.P., Marchant-Forde, J.N., Richert, B.T. and Lay Jr. D.C. (2011) Oxytocin reduces separation distress in piglets when given intranasally. In. (Eds. E.A. Pajor & J.N. Marchant-Forde) Proceedings of 45th Congress of the International Society for Applied Ethology. P5. Rault, J.L., Mack, L.A., Carter, C.S., Garner, J.P., Marchant-Forde, J.N., Richert, B.T. and Lay Jr. D.C. (2011) Prenatally stressed piglets shut down in response to social separation, but oxytocin modulates some effects. International Behavioral Neuroscience Society, 2011. Marchant-Forde, J.N., Garner, J.P., Lay Jr., D.C., and Johnson, A.K. (2011) Action-reaction: using Markov analysis to elucidate social behavior when unacquainted sows are mixed. In. (Eds. E.A. Pajor & J.N. Marchant-Forde) Proceedings of 45th Congress of the International Society for Applied Ethology. P71. Wisdom, S.L., Richert, B.T., Radcliffe, J.S., Lay Jr., D.C., and Marchant-Forde, J.N. (2011) The effects of diet ingredients on gastric ulceration and stereotypies in gestating sows. In. (Eds. E.A. Pajor & J.N. Marchant-Forde) Proceedings of 45th Congress of the International Society for Applied Ethology. P62. DeBoer, S.P., Garner, J.P., Eicher, S.D., Lay Jr., D.C., Lucas, J., and Marchant-Forde, J.N. (2011) Does the presence of a human effect the preference of enrichment items in young isolated pigs? In. (Eds. E.A. Pajor & J.N. Marchant-Forde) Proceedings of 45th Congress of the International Society for Applied Ethology. Wageningen Academic Press, Wageningen, The Netherlands.P52. Marchant-Forde, J.N. (2011) The benefits and challenges of group housing in farm animals. In. Proceedings of the 20th Meeting of the International Society for Anthrozoology. P26. Deboer, S.P., Garner, J.P., Eicher, S.D., Lay, Jr., D.C. and Marchant-Forde, J.N. (2012) Effects of social isolation and environmental enrichment on laboratory housed pigs In. (Eds. S. Waiblinger, C. Winckler & A. Gutmann) Proceedings of 46th Congress of the International Society for Applied Ethology. Wageningen Academic Press, Wageningen, The Netherlands. P94. Deboer, S.P. and Marchant-Forde, J.N. (2013) Tear staining as a potential welfare indicator in pigs. In. (Eds. M.J. Hotzel & L.C. Pinheiro Machado) Proceedings of 47th Congress of the International Society for Applied Ethology. P125. Morello, G., Marchant-Forde, J.N., Richert, B.T., Lay, D.C. and Rodrigues, L.H.A. (2013) The effects of non-uniform environmental conditions on piglet mortality and behavior of sows. In. (Eds. M.J. Hotzel & L.C. Pinheiro Machado) Proceedings of 47th Congress of the International Society for Applied Ethology. Wageningen Academic Press, Wageningen, The Netherlands. P69. Abdelfattah, E.M. Karousa, M.M, Schutz, M.M., Lay Jr., D.C. Marchant-Forde, J.N. and Eicher, S.D. (2013) Acute phase cytokine, substance-P, and TLR4 association with housing stress and health in veal calves. Research Workers in Animal Diseases Conference Proceedings, p100. Sapkota, A., Marchant-Forde, J.N., Richert, B.T. and Lay Jr., D.C. (2014) Using designer diets to reduce aggression in pregnant sows. Submitted to Journal of Animal Science, 92 (E-Suppl. 2). Kulczar, C.D., Roth. W.J., Kissinger, C.B., Hannou, S., Cooper, B.R., McCain, R.R., Marchant-Forde, J.N., Vreeman, R.C. and Knipp, G.T. (2014) Juvenile pigs as surrogates for human pediatrics during preclinical pharmacokinetic testing: a possible means to expedite pediatric drug development? Health and Disease: Science, Culture, and Policy Research Poster Session, Purdue University. P19. Marchant-Forde, A.E.M. and Marchant-Forde, J.N. (2014) Social status and tear staining in nursery pigs. In. (Eds. X. Manteca, I. Estevez, R.H. Marin & X. Averos) Proceedings of 48th Congress of the International Society for Applied Ethology. Wageningen Academic Press, Wageningen, The Netherlands. P145. Telkänranta, H., Valros, A.E. and Marchant-Forde J.N. (2014) Can tear staining in pigs be useful as an on-farm indicator of stress. In: Mounier L, Veissier I (eds) Proceedings of the 6th International Conference on the Assessment of Animal Welfare at Farm and Group Level. Wageningen Academic Press, Wageningen, The Netherlands. (2014) P52. Marchant-Forde, J.N. (2015) Beta-agonists and animal welfare. In: Proceedings of the 46th American Association of Swine Veterinarians Annual Meeting, March 2015. Marchant-Forde, J.N. (2015) Feeding/nutrition interactions affecting aggression. In: Proceedings of the 46th American Association of Swine Veterinarians Annual Meeting, Orlando, FL, March 2015. Marchant-Forde, J.N. (2015) Farm animal welfare in the U.S.: consumer concern, science and policy. In: Proceedings of the 3rd International Meeting of Animal Welfare Researchers, UNAM, Mexico City, Mexico. Morello, G., Richert, B.T., Lay, D.C., Rodrigues, L.H.A. and Marchant-Forde, J.N. (2015) Investigating sow posture changes; does environment play a role? In. (Eds. T. Yasue, S. Ito, S. Ninomiya, K. Uetake & S. Morita) Proceedings of 49th Congress of the International Society for Applied Ethology. Wageningen Academic Press, Wageningen, The Netherlands. P64. Marchant-Forde, J.N. (2016) Heart rate variability and the assessment of emotional state in animals. Measuring Animal Emotions Workshop, July 12th, Edinburgh UK. Eicher, S.D., Silva, E.B., Schutz, M.M. and Marchant-Forde, J.N. (2016) Leukocyte response to chronic pain in dairy cows. International Veterinary Immunology Symposium, Gold Coast, Australia, August 15-19 2016. Marchant-Forde, J.N., Nielsen, B.L. and Rodenburg, T.B. (2016) The role of the International Society for Applied Ethology (ISAE) in the global development of animal welfare science and its relationship with the OIE; strength through partnership. Proceedings of 4th OIE Global Conference on Animal Welfare, Guadalajara, Mexico, Dec 6-8, 2016. P66. Marchant-Forde, J.N. (2016) Future development of animal welfare science and use of new technologies Proceedings of 4th OIE Global Conference on Animal Welfare, Guadalajara, Mexico, Dec 6-8, 2016. P38. Marchant-Forde, J.N., Richert, B.T. and Lay Jr., D.C. The effects of dietary tryptophan around farrowing on sow behavior and piglet mortality. Proceedings of 51st Congress of the International Society for Applied Ethology. Wageningen Academic Press, Wageningen, The Netherlands. (submitted). Garvey, M.B., Petrosus, E., Marchant-Forde, J.N. and Eicher, S.D. (2017) Effects of probiotics on anxiety behavior in weaned pigs. ISAE North American Regional Meeting. Morello, G.M., Olsson, I.A.S., Lay Jr., D.C., Rodrigues, L.H.A., Richert, B.T. and Marchant-Forde, J.N. (2017) Investigating microenvironment to improve the survivability of production and laboratory animals. TiBE 2017, Vairão, Portugal, June 2017. Eicher, S.D., Schutz, M.M. and Marchant-Forde, J.N. (2017) Reduced chronic pain by rubber flooring alters leukocyte populations, phenotypes, and response to substance P of dairy cows. Society for Leukocyte Biology, Vancouver, BC, CA. October 5-7, 2017. Bratton, E., Eicher, S.D., Schutz, M.M., Marchant-Forde, J.N. and Proudfoot, K. (2017) The effect of long-term exposure to concrete flooring on behavioral indicators of pain in cattle. 2017 National Veterinary Scholars Symposium. Parois, S.P., Eicher, S.D. and Marchant-Forde, J.N. (2018) Supplementation of female piglets from 1 to 28 days of age with a synbiotic: what consequences on cognitive abilities? In. (Ed. M. Cockram) Proceedings of 52nd Congress of the International Society for Applied Ethology. Wageningen Academic Press, Wageningen, The Netherlands. Submitted. Parois, S.P., Johnson, J.S. and Marchant-Forde, J.N. (2018) Effects of dietary L-glutamine as an alternative for antibiotics on the behavior and welfare of weaned pigs after transport. In. (Ed. M. Cockram) Proceedings of 52nd Congress of the International Society for Applied Ethology. Wageningen Academic Press, Wageningen, The Netherlands. Submitted. Bratton, E., Eicher, S.D., Marchant-Forde, J.N., Schutz, M.M. and Proudfoot, K. (2018) The effect of long-term exposure to concrete or rubber flooring on lying behavior in cattle. In. (Ed. M. Cockram) Proceedings of 52nd Congress of the International Society for Applied Ethology. Wageningen Academic Press, Wageningen, The Netherlands. Submitted. Parois, S.P., Johnson, J.S., Richert, B.T., Eicher, S.D. and Marchant-Forde, J.N. (2018) Modification of piglet behavior and welfare by dietary antibiotic alternatives. Book of Abstracts of the 69th Annual Meeting of the European Federation of Animal Science. Wageningen Academic Press, Wageningen, The Netherlands. Submitted. Marchant-Forde, J.N. (2018). You'll miss the best things if you keep your eyes shut: the art and science of animal behavior. Book of Abstracts of the 69th Annual Meeting of the European Federation of Animal Science. Wageningen Academic Press, Wageningen, The Netherlands. Submitted. Marchant, J.N. * (1990) An investigation of a novel cell-blotting technique for quantifying prolactin secretion by bovine anterior pituitary cells. B.Sc. Thesis, University of Bristol, UK. Marchant, J.N. * (1992) Farm animal welfare – what does it mean for smallholders? Smallholder, 10 (Apr 1992), 7-8. Marchant, J.N. * (1994) Good stockmanship + happy healthy animals = profit. Smallholder, 12 (June 1994), 22-23. Marchant, J.N. * (1994) Essentials of pig housing. Smallholder, 13 (Oct 1994), 14-15. Marchant, J.N. * (1994) A cry for help (Stable Vices). Your Horse, December 1994: 93-93. Marchant, J.N. * (1995) Animals behaving badly – aggression and its consequences. Smallholder, 13 (Jan 1995), 28-29. Marchant, J.N. * (1995) Caring for the weaned piglet. Smallholder, 13 (June 1995), 16-18. Marchant, J.N. * (1995) Freedom and farm animal welfare. Smallholder, 14 (Oct 1995), 20-21. Burke, J. * and Marchant, J.N. * (1997) Crateless farrowing–will it ever work? Pig Farming, 45 (Jan 1997): 28-29. Burke, J. * and Marchant, J.N. * (1997) Can crateless farrowing ever prove to work successfully? Pig Farming, 45 (Feb 1997): 19. Marchant, J.N. * and Burke, J. * (1997) It’s a hard life for sows in these pools of discontent. Pig Farming, 45 (Apr 1997): 36-37. Marchant, J.N. * (1997) Alternative farrowing systems. International Pig Topics, 12 (4): 13-17. Marchant-Forde, J.N. * and Cheng, H.W. * (2010) Tryptophan enriched diet reduces pig aggression. Agricultural Research, 8: 23. Marchant-Forde, J.N. *, Lay Jr.*, D.C., Pajor, E.A., Richert, B.T. and Schinckel, A.P. (2002) The effects of Ractopamine on behavior and physiology of finishing pigs. Purdue University Swine Research Reports 2002, 118-126. Marchant-Forde, J.N. * and Pajor, E.A. (2003) Dietary sodium bicarbonate and stereotypic behavior in sows. Purdue University Swine Research Reports 2003, 72-75. Brumm, M.C. *, Richert, B.T., Marchant-Forde, J.N. and Marchant-Forde, R.M. (2005) Out-of-feed events in grow-finish pigs: causes and consequences. Nebraska Swine Report 2005, 9-11.